Teresa is a compost program coordinator at Green Action Centre, which means she gets to say the word “poop” a lot more in an average day than most people! 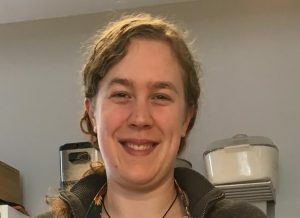 She hold a Bachelor of Arts in Environmental Studies and Psychology from The King’s University (Edmonton), and a Master of Natural Resources Management from the University of Manitoba. She’s dedicated her life to date to trying to figure out how, using our knowledge of how people learn, relate, and think, we can move individuals and societies towards greater sustainability. Her theory is that people care for what they love, they love what they know, and they know what they have experienced. Prior to working with Green Action Centre, Teresa was a Youth Ambassador for Development & Peace – Caritas Canada. Currently, she focuses on food waste and composting education and advocacy, working with multi-family buildings, schools, and individuals to reduce their barriers to waste reduction and diversion. When not out spreading the word about compost, or (more commonly) trying to organize people and events from behind a computer screen, you can find Teresa reading, cooking, kayaking on Falcon Lake, helping out at her parish, or settling into married life.